Now that Spring has sprung we all want to get outside and go for long walk or jump in the car for a nice long drive. Traveling can be a lot of fun, and you can avoid headaches and setbacks by planning ahead. Being on the road for a long drive (especially with kids) means preparation. So is trying to find a snack that can pass through airline security. And forgetting a snack means a hungry, cranky child (or driver.) To help you prepare for long spring drives or walks we are sharing our Top Three Trail Mix Snack Ideas. We found our ingredients in the nut and baking aisles, in the snack and candy sections and in the bulk bins at a local grocery store. Substitute ingredients and change it up to make your own personal trail mix. You can add or subtract any ingredients you want and get creative with the process. Perhaps your kids would appreciate the addition of cheese crackers, graham crackers or mini marshmallows. Feel free to add whatever you want to the mix. The kids will love it and can even help make it. We love the bright colors in this trail mix and the flavors all blend well together. Keep this in your purse in a snack-sized bag for an easy and healthy snack on the go. A few of us here will be keeping this trail mix around the office to quell late-afternoon hunger pangs. 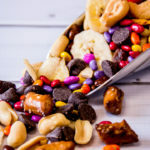 Other great ideas for this elevated type of trail mix would be dried pineapple, macadamia nuts, coconut, pepitas, and dark chocolate chunks. Your email has been sent! Thank you for your interest in Hamilton Beach Brands, Inc.